RMS-100 has general purpose I/O pins and Buttons for custom applications!. Below is a screen shot of the RMS-100 I/O overview page. Here you can choose which of the boards Alarm or I/O pins to control. RMS-100 has 5 dedicated Alarm Pins that have a corresponding LED. Use them with common door contacts to monitor entry points, or use them for solar panel theft prevention. RMS-100 also has 4 general purpose pins that can be set as Inputs or Outputs. These multi purpose I/O pins can be controlled or read from either the web page interface or a command shell. RMS-100 also has 2 micro push buttons that have special attributes when the RMS-100 board is booting. After the RMS-100 board is finished booting these buttons are free for you to use for controlling your devices. 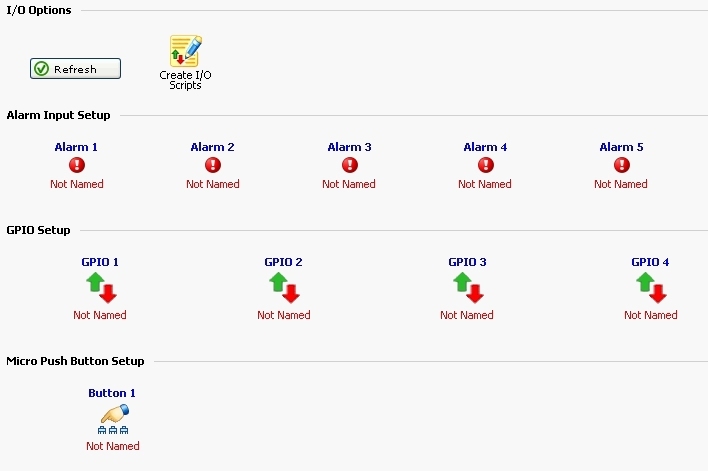 Below is a screen shot of the RMS-100 I/O setup page for GPIO 1. GPIO pins can be configured to be 3.3 volt Inputs or Outputs. Use these pins to control any manner of devices, or sense condition changes and react with alerts or scripts. Below is a pinout diagram of Con 8 on the RMS-100 board. These are 3.3 volt general purpose I/O pins. Pin 1 is VDD (3.3 volts). Pin 2 is General Purpose I/O pin 1. Pin 3 is General Purpose I/O pin 2. Pin 4 is General Purpose I/O pin 3. Pin 5 is General Purpose I/O pin 4. Below is a pinout diagram of the Alarm pins on the RMS-100 board. These input pins are pulled up to 3.3 volts. JP1 - Pin 1 is Alarm input 1. Pin 2 is GND. JP2 - Pin 1 is Alarm input 2. Pin 2 is GND. 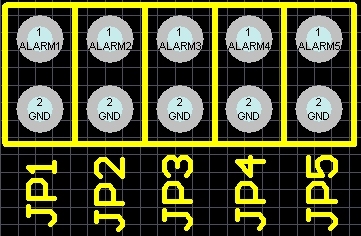 JP3 - Pin 1 is Alarm input 3. Pin 2 is GND. JP4 - Pin 1 is Alarm input 4. Pin 2 is GND. JP5 - Pin 1 is Alarm input 5. Pin 2 is GND. Below is a picture of the RMS-100 user programmable push button. Use this button to manually control devices, or use it for onsite testing of alerts or scripts. 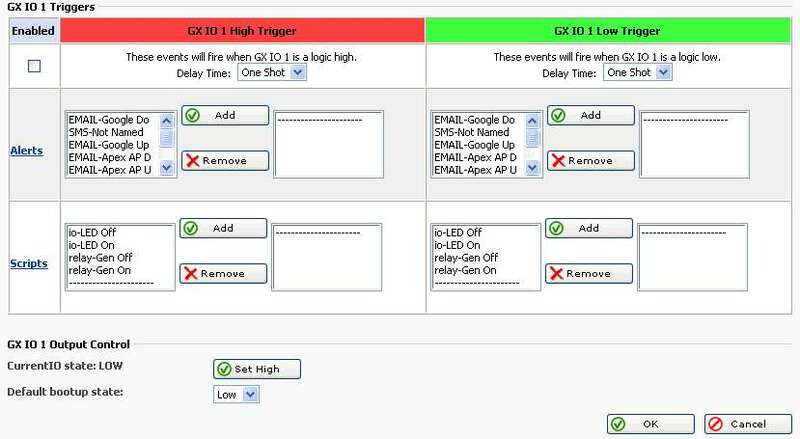 Below is a screen shot of the RMS-100 Push Button 1 setup page. Add email alerts and run custom scripts or programs when the button is pushed. When the RMS-100 is booting up it first checks to see if Button 1 is being held down. If Button 1 is held down then all of the configuration files in /etc are re-written bringing the RMS-100 unit to a factory default condition. When the ALARM LEDS on the RMS-100 board perform a flashing sequence, the Linux OS has fully booted and normal button operation can commence.